CLICK HERE TO PURCHASE YOUR MEMBERSHIP! Every year, Creation Station welcomes new panelists and innovates new panels. This year, we’re also in a new context! Creation Station is in rooms Rey and Jyn, which is a 2-room Suite, 165 A & B. Being in a Suite adds to our safe space in that you can bring comfort food and (non-alcohol) beverages with you, and some of our panels specifically feature food! We also have our own single-person, all-gender restroom (please accept our apologies that, while our room is accessible, its bathroom is not). Here are some of the new topics and special events we’re introducing this year, while still including fan favorites, such as our all-day/night Whovian track Friday and our always-adorable Kitten Caboodle: Making Cat Toys, Sharing Cat Joys event; explicitly progressive political analyses, such as Black Cinderella and the New Jim Crow: Media Representation in Post-Racial America, and Geeks Against Misogyny, Entitlement, and Racism; an updated repertoire for our Sing-Along with Fallen Musical Idols, to reflect upon and give homage to those we’ve lost in the most recent few years (Bowie, Prince, Cohen, Burns, Michaels, Cornell, Bennington, Petty); and fanfic, anime, hands-on, all-ages craft how-to’s, and cosplay content, reflecting our roots. Robots and Cyborgs and Androids, Oh, My! Some ‘droids might be walking, while others might fly! 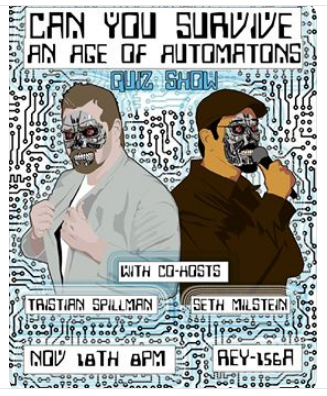 Could you battle ‘bots from the future, outwit bit-wits from days gone by? Well, you’ll never know until you try! Come compete, or cheer on those you meet, in our interactive trivia game, complete with stand-up comic hosts and prizes for those best at thinking on their feet! Often, when AI has a body, it’s coded female and has tons of sexual elements in stories, vs. the less common but more “universally human” stories we get about male AI. How does this limit the stories we see? Anyone, especially cosplayers, might need to know how to fix a button on the fly, or help a hem in a hurry. Prepare for future wardrobe malfunctions by learning basics of sewing repair and how to build a DIY sewing repair kit. No experience necessary, but kids under 10 need adult supervision, given presence of sharp sewing needles. Some hospitals request crocheted toys or hats for premature babies. Sometimes, specifically crocheted octopi, as the tentacles comfort babies by reminding them of holding their umbilical cords in the womb. If we have enough interest, we will help people have some materials and instructions to make toys to donate to hospitals for premies. This panel will focus on innovating and planning fandom events that are built from the very beginning with inclusivity as a central core value, practice, and foundation. We internalize the messages the media sends us every day — we’re the wrong shape, the wrong color, the wrong gender, the wrong everything to cosplay the fictional characters that we love. SCREW THAT. Come meet people who cosplay out of type, and learn why you SHOULD cosplay that character who looks nothing like you. Ask questions and get ideas for making that cosplay come to life! Self-care, a concept from Black feminism, has become a trendy hashtag — and it’s often been co-opted and reduced to consumerism. But it’s a lot more than bubble baths and Netflix! Come join a group of geeks for a discussion about what self-care means, why we need it, how it’s different for geeks, and how we can make that work for us. A discussion of what constitutes feminist film-making. The Bechdel Test originated in Alison Bechdel’s comic from the ’80s-’90s, “Dykes to Watch Out For.” To pass, a film must feature at least 2 female characters, who talk, to each other, about something other than a man. Mako Mori is a lead character in “Pacific Rim,” who is entirely strong and admirable, who is the heroine of the film, and who has a story arc that is not about her love-life. But “Pacific Rim” fails the Bechdel test; so, some have proposed a “Mako Mori Test” for films. Tween-led meetup of anime fans, oriented for tweens, teens, and young adults, but all ages welcome. Whether you’re already a big fan of anime, manga, anime-styled games, J-pop, K-pop, anime culture, anime theme songs,anime cosplay, or just curious about the phenomena, come hang out and make new friends, and discover your new favorite flavor of Pocky! Bring your show & tell, from your fanfics, fan art, fan crafts and amigurumi to your collectible cards and cosplay props. Talk about your favorites and learn about some new must-sees. Plan your adventures for anime-oriented cons! Which anime (Japanese animation) and manga (Japanese comic books or graphic novels) are your faves deserving raves? What are the yawns only for pawns? Which are merely meh? 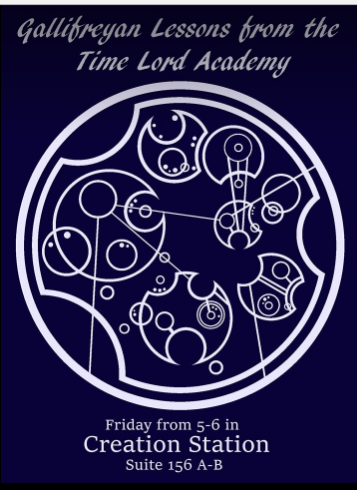 Tween-led panel, open to all ages, and to all from the most savvy otaku to the greenest noob. Engaging with your fandom, rewriting scripts to see yourself in your favorite stories or acting or dressing as characters therefrom, can help with embracing body positivity and with breaking down stereotypes about ethnicity, gender, and orientation. American gods, the Neil Gaiman novel, has enthralled readers and, now, viewers, with its modern embodiments of dieties and concepts. In discussions, and via fanfic drabbles, share with us your perspectives on the novel, the series, and whom, or what, you could also envision personified: their characteristics, mannerisms, aesthetics. How do we respond when we find out yet another man who’s work we love has done or continues to do terrible things? Please note: We believe survivors, here. Always. CONTENT ALERT: This discussion is intended as safe space. Some subject matter may be triggering. This panel takes place in a suite. You may bring comfort food and (non-alcohol) beverages. Parents are strongly advised that some content might not be suitable for those younger than 14. Meetings are done for 2017! 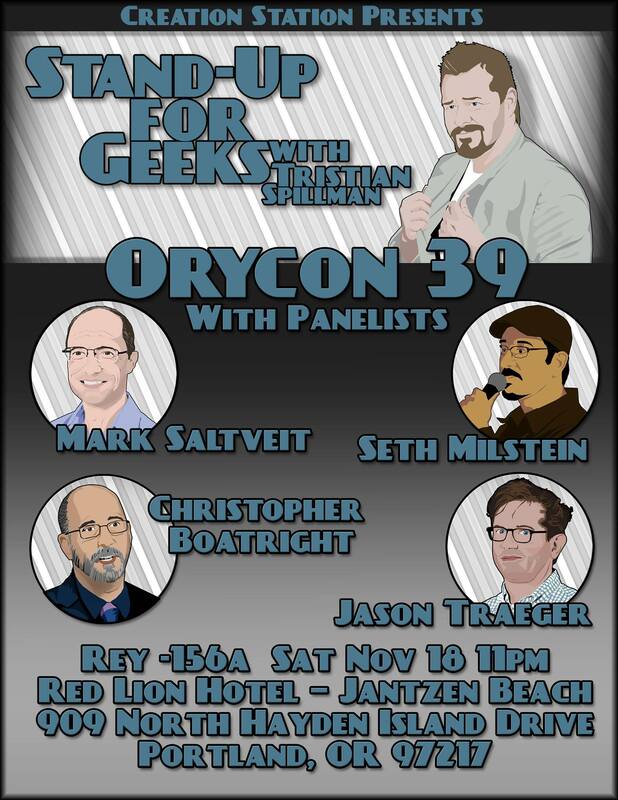 OryCon 39 is a production of Oregon Science Fiction Conventions, Inc. (OSFCI), a non-profit, tax-exempt corporation. For general information on OryCon, see http://www.osfci.org/orycon.